Tired of running out of hot water? 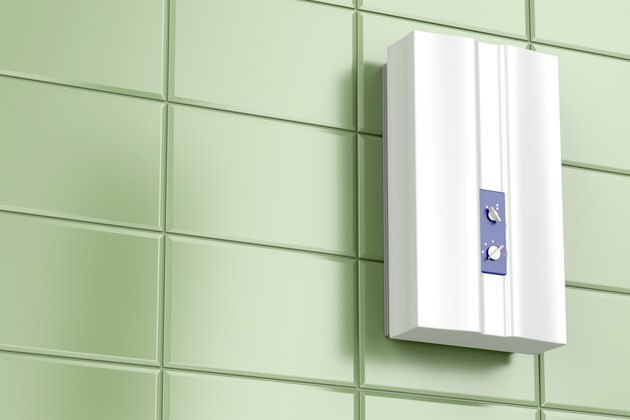 A tankless water heater can eliminate that surprising blast of cold water if you're the last one to take a shower. But how does such a small unit with no tank deliver hot water whenever you need it? The system uses heating elements to quickly heat up just the amount of water you need to eliminate the large tank and cut down on energy use. A traditional water heater features a large tank that takes up a lot of space. That's where the system heats the water and keeps it hot until you need it. If you use a large amount of hot water in a short period of time, you may run out, which means you have to wait until the system heats the water again. It also uses a lot of energy. A tankless water heater is a much smaller unit. It typically attaches to the wall instead of sitting on the floor. Since it doesn't heat and store water ahead of time, the on-demand water heater doesn't have a tank. Instead, the unit draws water through it to heat it. A tankless water heater doesn't actually heat the water until you need it, which is why it's sometimes called an on-demand water heater. When you turn on a hot water faucet or run your dishwasher or washing machine set to hot, the cold water flows into the unit and through a flow sensor. That sensor triggers the gas burner or electric element, which provides the heat. Water flows through the heat exchanger, where it heats up quickly. The unit automatically adjusts the burner to keep up with the water flow to make sure the temperature remains consistent. Heated water comes out of the unit and travels to your faucet, shower, dishwasher or washing machine. The water heater only heats water when you use hot water rather than heating and keeping water warm all day. How do you choose between a gas and electric on-demand water heater? A gas system typically works better for a whole house situation because it can get the water hot efficiently with higher flow rates. In other words, gas systems are better able to keep up with high demands for hot water. Electric systems generally work best when installed near the faucet it will heat for a point-of-use setup rather than a whole-house water heater. Electric tankless water heaters also typically need higher flow rates of water to reach the desired temperature. Keep in mind that an electric unit may significantly increase your energy consumption, and you may need to upgrade your electrical system to handle the demands. Even with the quick heating and reduced energy consumption, tankless water heaters come with some drawbacks to consider. These water heaters provide a continuous stream of hot water, but they may limit the water pressure when you're using hot water. And the system can't always handle high demands from multiple places at once. For example, if you're taking a steaming hot shower and someone starts the dishwasher, you may notice a drop in the water flow. You'll still get hot water, but it may not be at the same rate. Tankless water heaters save space and energy, but it's also important to understand the limitations. Knowing how an on-demand water heating system works helps you decide if it's the best option for your home.